Robert’s entrepreneurial flair provides clients with the opportunity to work with an architect who is able to identify unique commercial opportunities and produce designs that help them achieve profitable results. Robert Caulfield is an internationally renowned and award winning architect having designed significant buildings throughout Australia; the middle east, Asia and the United States. He is the founder of and for 31 years the managing director of Archicentre Limited, Australia’s largest building advisory group. He appears frequently on T.V. and radio and in the media discussing all aspects of buying, building and renovating buildings. He is a past national president of the Australian Institute of Architects, president of Kidsafe Victoria and an experienced company director. Since graduating with honours in Design and Professional Practice from RMIT University, Robert’s career has been highlighted by many awards and achievements which reflect his dedication and commitment to the profession. 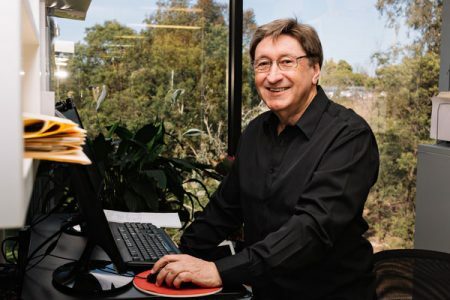 In 1977 he was awarded a research grant by the Royal Australian Institute of Architects (RAIA) for the study of possible methods of building procurement up to the year 2000. A citation by the RAIA in 1978 gave Robert recognition for the proposed development of a range of architectural advisory services to help the general public. This was to become Archicentre. In 1978, Robert along with Ivo Krivanek also formed Caulfield & Krivanek Pty Ltd, architects, planners and interior designers. In 1984 Robert was awarded another professional citation for the conception and implementation of a number of building and design services. 1986 saw Robert awarded the prestigious RAIA Sisalation research scholarship for international research into the prevention of building failures and maintenance problems. This experience has subsequently been applied to many of Caulfield & Krivanek’s projects and to the development of Archicentre’s technical expertise. In 1987, Robert was awarded the Victorian President’s Architecture Medal for outstanding services to architecture. In 1990, he was elected National President of the Royal Australian Institute of Architects, the youngest president up until that time. From 2000 onwards Robert has been involved with the design, documentations and construction of major residential and commercial projects in Australia, Dubai, China, Vietnam, Iran, Azerbaijan and Byelaruss. However, he still has extensive involvement with all aspects of domestic residential construction. Robert is an experienced company director and apart from corporate directorships has been involved at a senior level with many community organizations and is currently president of Kidsafe Vic Inc, founding president of Kidsafe Victoria, and a former director of the Western Bulldogs Forever Foundation. He is also a director of Homesafe Pty. Ltd., a child home safety organization and a former director of Yachting Victoria. In 2002 Robert was awarded a Centenary Medal by the federal government for services to architecture. In his spare time Robert enjoys competitive sailing, golf, tennis and scuba diving. 2002 Federal Government Centenary Medal for service to Architecture. 2002 Director and Founding President – Kidsafe Vic Inc.
2000 “How Successful Architects Make Money”. A series of seminars for Architects. Melbourne, Sydney, Brisbane, Adelaide, Perth, Canberra, Hobart, Launceston, Auckland. 2001 New South Wales Country Architects Convention (Ballina) – chairman and presenter “Architecture on Mars”. 2001 National Housing Conference – Adelaide. Chairman and presenter. 2001 “Living Safer, Healthier and Happier – a housing profile of Victoria’s older population” – A research paper based on findings from Archicentre’s Home Services Program. “Quality of Owner Built Buildings”. A research paper prepared in conjunction with Deakin University. “Australian’s Residential Building Faults. A View From The State of Victoria” a research paper prepared in conjunction with Deakin University and featured in The Building and Environment International Journal. “National Town Planning Survey” A survey of architects and research report prepared by Archicentre and presented to state and federal governments and the media. 2003 “Inquiry on First Home Ownership”. A research paper prepared by Archicentre and the RAIA at the request of the Federal Government’s Productivity Commission. 2003 “How Successful Architects Make Money”. A series of continuing education seminars commissioned by the New Zealand Institute of Architects Auckland, Wellington, Christchurch, Dunedin, Napier. 2005 “Making Homes Safe as Houses” an updated profile of Victoria’s older population. A research paper based on findings from Archicentre’s Home Services Program. 2006 – 2009 Archicentre Cost Guide.